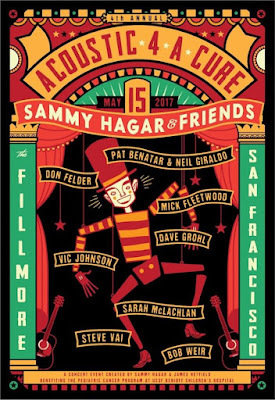 Sammy Hagar and Metallica’s James Hetfield have announced details for the fourth annual "Acoustic-4-A-Cure" benefit concert at The Fillmore in San Francisco on May 15. The event – which benefits the Pediatric Cancer Program at UCSF Benioff Children's Hospital – will see acoustic performances by Hagar and a lineup that includes (in alphabetical order) Pat Benatar & Neil Giraldo, Don Felder, Mick Fleetwood, Dave Grohl, Vic Johnson, Sarah McLachlan, Steve Vai and Bob Weir. Grohl will perform in place of Hetfield, who will be away on tour with Metallica. Tickets will go on sale Friday, March 31 at 10:00 AM PDT at LiveNation.com. There is a two-ticket limit per customer. NOTE: Tickets will not be available at The Fillmore box office, charge by phone or outlets. All proceeds from the concert will be donated to fund children's brain tumor research at UCSF Benioff Children's Hospital, one of the nation's leading children's medical facilities. Hagar and supergroup Chickenfoot have just released “Best + Live”, a two-disc compilation of tracks from the band’s two studio albums alongside audio from a 2009 concert in Phoenix, AZ originally only available as video on the 2010 DVD/Blu-ray "Get Your Buzz On."